Citation: Guertin P. How safe are glycerin and polyglycerin-10 as key ingredients in personal care products. Clin Pharmacol Toxicol Res. 2018;1(2):31-32. Glycerin and some of its related compounds such as polyglycerin-10 are used by the industry in the making of so called eco-friendly and safe personal care products. They are humectants found naturally in lipids (e.g., vegetal origin) that can be used as emulsifiers in moisturizers and antiaging products. They are found also in food products (e.g., as sweeteners), electronic cigarettes, antifreeze liquids, suppositories, and hair gels. They have been reported to lack carcinogenic and genotoxic effects. Although generally considered by some authorities as safe, preliminary evidence of allergenicity has been reported. The health consequences of polyglycerin-10 applied topically over long periods of time in humans (children, adults and elderly) has not been clearly studied. Glycerin is generally considered as a safe molecule, except perhaps in some pathological conditions. Glycerin, also known as glycerine, glycerol, propanetriol, 1,2,3-trihydroxypropane, or 1,2,3-propanetriol is a rather small molecule (92 g/mol, C3H8O3) (Figure 1) sold to the industry by manufacturers as a colorless, odorless, and syrupy liquid. Natural glycerin is obtained as a byproduct in the conversion of fats and oils to fatty acids or fatty acid methyl esters. In recent years, it has been reported as the third most frequently used cosmetic ingredient –15,654 products contain some glycerin . It is not considered by the US Cosmetic Ingredient Review (CIR) as a dangerous compound when used normally [2,3]. Administered orally, it is rapidly absorbed from the intestine and the stomach, distributed throughout the extracellular space, and excreted renally . The oral lethal dose (LD50) of glycerin is rather high i.e., >2530 mg/kg in rats and 1428 mg/kg in humans . Administered topically for dermatological indications (e.g., xerosis, pruritus, etc. ), there were no undesirable effects reported following long-term administration (i.e., 5 days per week for 45 weeks) of glycerin on large body surface areas in rabbits. No evidence of genotoxicity and carcinogenicity was found when administered systemically (i.p.,p.o.) in rats. No irritating effects on the skin of rabbits but mild irritating effects in guinea-pigs were reported . In humans, a few safety concerns have been found. In a large study, one patient (out of 421) with eczema topically applying glycerin was reported to experience significant skin reactions 48 hours post-exposure . A case report was also found a 29-year-old woman with eczema on her eyelids, face, neck, scalp, and axillae had a positive reaction to patch tests 4 days after treatment (glycerin) onset . A meta-analysis of clinical studies with urea and/or glycerin has revealed that urea may be superior than glycerin against atopic dermatitis [7,8]. In a clinical study (197 patients) on atopic dermatitis, 10% of the subjects tested daily for 30 days with glycerin-containing creams (20% glycerin) experienced adverse skin reactions such as smarting . Another case report has described an 81-year-old woman with exanthemas developing urticarial eruptions one hour after glycerin (50%) application . This said, nearly 56,000 publications about glycerin (1920-pres) were found in PubMed. Among them, only rare cases report undesirable effects such as those described above. Figure 1: Molecular structures of polyglycerin-10 (left) and glycerin (right). 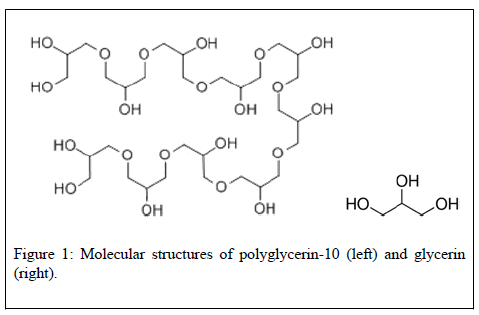 The safety of polyglycerin-10 is unclear: Polyglycerin-10, also known as decaglycerol, polyglycerol, or polyglyceryl-10 dioleate, is molecularly much larger (758 g/mol, C30H62O21, Figure 1) than glycerin although they physically look alike – both transparent and viscous. As glycerin, it has not been associated by CIR with significant safety issues [2,3]. Administered orally in animals, polyglycerol esters or polyglycerin-10 are hydrolyzed in the gastrointestinal (GI) tract . Repeated oral administration of 10 g/kg polyglycerol ester daily over 5 days caused no deaths in rats  nor in humans (after 3 weeks) whereas no abnormal hematologial or clinical chemistry data were reported . Genotoxicity and carcinogenicity tests in animals remained negative [3,11]. According to the CIR committee – polyglycerin-10 shall be consider as a safe cosmetic ingredient in the practices of use and concentration described in preclinical and clinical tests. However, preliminary evidence of skin irritation was reported . Indeed, a case report described the incidence of recurring pruritic erythema in an 80-year-old woman using polyglycerin esters  whereas in a clinical study, 7% Polyglyceryl-2 Isostearate elicited slight dermal irritation . However, only 654 related articles in Pubmed (1980–pres) were identified. None of which has explored the health consequences of polyglycerin or polyglycerin esters when applied topically over long periods of time. No related clinical trials are currently being conducted (clinicaltrials.gov). Glycerin has been used by the cosmetics industry for a long time. It is thus generally considered as a rather safe ingredient. Therefore, there should not be contraindication for its use although further attention should be paid to potential side effects when applied onto problematic skins (e.g., atopic dermatitis, eczema). Less safety data exists for polyglycerin-10 and its esters (e.g., laureate) probably because they have been introduced by the industry more recently. Therefore, it should probably be used with caution either less frequently of with lower concentrations at least until regulatory agencies (e.g., FDA, EMA, Health Canada, etc.) force the industry (manufacturers or biocosmeceutical companies) to conduct clinical trials aimed specifically at demonstrating clearly their safety when used regularly for dermatological indications in both healthy adults and vulnerable populations (e.g., elderly with chronic diseases or fragile skin, children). Safety Assessment of Glycerin as Used in Cosmetics. CIR’s scientific literature review for final report. 2014. Safety Assessment of Polyglyceryl Fatty Acid Esters as Used in Cosmetics. CIR’s scientific literature review for public comment. 2016. World Health Organization (WHO). Toxicological evaluation of some antimicrobials, antioxidants, emulsifiers, stablizers, flour- treament agents, acids and bases. 1967. Lin EC. Glycerol utilization and its regulations in mammals. Annu Rev Biochem. 1977;46:765-95. Tao RC, Kelley RE, Yoshimura NN, et al. Glycerol: Its metabolism and use as an intravenous energy source. JPEN. 1983;7:479-88. Preston PW and Finch, TM. Allergic contact dermatitis from glycerin in a moisturizing cream. Contact Dermatitis. 2003;49:221-22. Lindh JD, Bradley M. Clinical Effectiveness of Moisturizers in Atopic Dermatitis and Related Disorders: A Systematic Review. Am J Clin Dermatol. 2015;16:341-59. Hannuksela M, Förström L. Contact hypersensitivity to glycerol. Contact Dermatitis. 1976; 2:291. Lodén M, Andersson AC, Anderson C, et al. A double-blind study comparing the effect of glycerin and urea on dry, eczematous skin in atopic patients. Acta Derm Venereol. 2002;82:45-7. Suzuki R, Fukuyama K, Miyazaki Y, et al. Contact urticaria syndrome and protein contact dermatitis caused by glycerin enema. JAAD Case Rep. 2016;2:108-10. European Food Safety Authority (EFSA). Scientific Opinion on the safety assessment of the substance, polyglycerol, CAS No 25618-55-7, for use in food contact materials. EFSA. 2013;11:3389. Washizaki K, Kanto H, Yazaki S, et al. A case of allergic contact dermatitis to polyglyceryl laurate. Contact Dermatitis. 2008;58:187-88.